I kind of missed a lot of updating the past few weeks. But a lot did happen – we went to Bermuda for our 10 year anniversary which was awesome. I turned 35 (35!! I still can’t believe it). 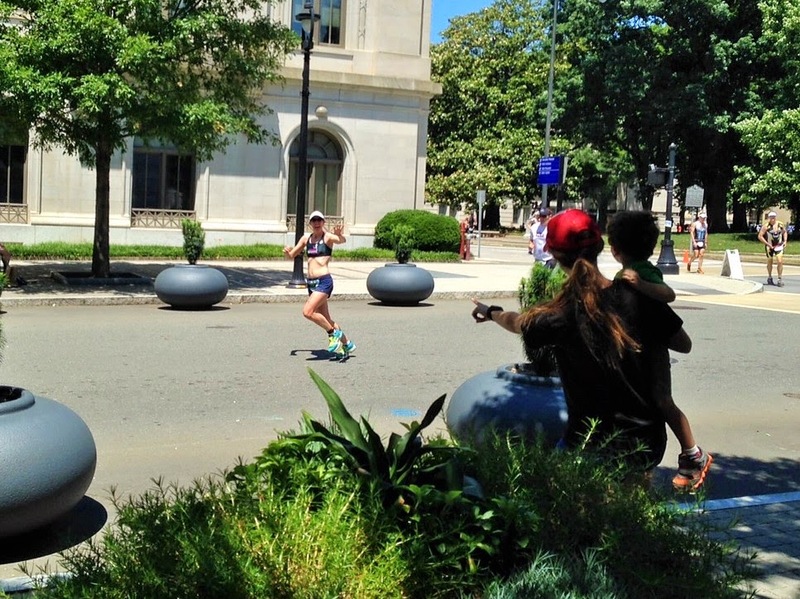 And this past weekend I did a relay at the Raleigh 70.3. Since I’m old now and can’t remember things, I will talk about the latest adventure since it’s still fresh in my mind. I knew after last year I didn’t want to do the entire race again. I am not a long course athlete. Yes, I can do well at the distance, if I train properly, but I honestly don’t like ‘going long.’ I am happy doing sprints and Olympics and know myself well enough that I would not have enjoyed (again) the training involved. Not to mention Logan is so, so fun and I mostly want to hang out with him when I do have spare time. I luckily had some friends who were also not wanting to do the entire race (because they would be doing Eagleman next weekend) so bam, the One Step Beyond Babes were born. Back when we signed up I had good intentions of getting in really good half marathon shape and throwing down an awesome time, but blah blah blah, training for this went on the back burner and my longest run since the Myrtle Beach Half in February, was 11 miles. Woopsy. But let me tell you, doing a relay is where it’s at! You get all the hoopla without all the pain. And put yourself on a fast swim-bike relay team and you end up on the run course with lots of other athletes. Alysia (swimmer) broke 30min and Mary (biker) had the fastest bike of all females in the race. Boom. Sorry guys, I really hope to break 1:50 but will be super happy with a 1:40. Because although I’m a runner, I can have some spectacular meltdowns at the longer distances. And I knew I was under prepared for this so just didn’t know what would happen. Two things that were going to help me: 1) they changed the run course from last year so we wouldn’t have any BIG hills, just some smaller rollers that would be repeated, 2) the weather was about 1,000x better this year, topping out at 79 degrees with much lower humidity (90s and humid last year). It was a bit windy which made the run nicer, but apparently the bike much harder this year. I also was experimenting a bit with my nutrition as I have had some trouble all year with my stomach and longer runs. I made sure to get enough calories the morning of in the form of two Honey Stinger waffles and a gel and then ate Sport Beans throughout the race. It worked! No bathroom troubles during or after which is huge for me. I was a bit hungry before I started but I guess I can deal with that if it means I don’t have to deal with bathroom issues. When I got the chip from Mary I was determined, DETERMINED, not to go off at a pace that was in any way, shape, or form, uncomfortable. Many of the guys that started off with me (who were doing the entire race) were running much faster than I wanted to. I stuck to my plan. And I saw most of them later on in the course :) The run this year was two out and backs, run RIGHT by the finish line sort of deals. Crowd support was awesome again and I knew so many people out there which kept it all interesting. I stayed steady-eddie for the entire first lap and assessed the situation – I don’t feel bad at all. I had less than 1hr to go and figured I could start picking it up. The first part of the second lap was definitely the hardest for probably everybody – it was now a little hotter and the hills seemed a little harder the second time. My attempt to pick it up actually meant I stayed at the same pace, but compared to other splits I’ve seen, this was good. I hit the final turn around and now it was more of a net downhill which is how every race should end I believe. I didn’t have any ‘uh-oh’ moments except until I got to around 11.5 and I started to feel the distance in me (or probably my body was asking, wait, aren’t we done yet?!) I ended up splitting a 1:36:28 which I was very happy with. Okay, I realize that this is way off my pr but in my current shape this is awesome. So ahem to the person who looked at me and told me that was slow. My relay finished 2nd in the relay division (but of course 1st for all females!) and my friend Kari absolutely nailed her race which made the day even better. The best babysitter ever brought Logan down again to cheer us on. It was awesome seeing him on both loops. I like this picture because of how cute the two of them look pointing at me. Please excuse my impression of a starving child. My besties. Swim relay teammate Alysia and super fast girl Kari.